This article sheds some light on the possible influence of karate on the establishment of the “Seiryoku Zen’yo Kokumin Taiiku no Kata”. The “Seiryoku Zen’yo Kokumin Taiiku no Kata” (in the following SZKTK) is a collection of combative movement exercises, created under inclusion of concepts from the field of physical education. It translates to “Form of national physical education of maximum efficiency”. It was officially released by the founder of Jūdō, Kanō Jigorō, in 1930 and today is one of the ten kata that are recognized by the Kōdōkan. The SZKTK consists of two categories: The first category consists of 29 individual movements (tandoku-undō), performed by a single person. 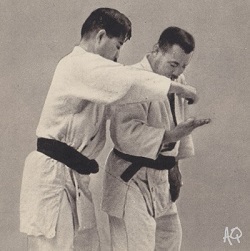 The second category consists of 20 partner exercises, performed by two persons (aitai-undō). Its salient characteristic is the almost exclusive use of atemi (impact) techniques. These atemi techniques particularly seem to indicate that Kanō incorporated results of his exploration of karate into this form. In his 1888 lecture Kanō strongly opposed any clams that jūjutsu originated in Chinese martial arts of any kind, while some of the major schools employing the concept of atemi clearly referred to it (See Chin Genpin, Akiyama and others), wich probably rendered it some sort of ideological no-go for Kanō at the time, or at least to be treated with great care. As regards a possible influence from karate: Kanō grew interest in karate – with Okinawa being Japanese – in 1908, when pupils of the Okinawan 1st Middle School of Shuri presented karate at the youth tournament held by the Butokukai in Kyōto, which “Doctor Kanō attentively observed with bated breath”. From the chapter “Dangerous and fatal blows” as explained in “Das Kano Jiu-jitsu”, 1905. “strikes in five directions (gohō-ate)”. Further references to atemi techniques made by Kanō next appeared in his “Overview of Jūdō” (Jūdō kaisetsu, 1913). In May 1922 Gichin Funakoshi (1868-1957) came to Tōkyō to present Karate at the 1st Exhibition of Physical Education, sponsored by the Japanese Ministry of Education. In June the same year Kanō invited Funakoshi for a demonstration of karate at his Kōdōkan Jūdō Institute. At that time Funakoshi was provided both a jūdō practice uniform and a black belt to wear during his demonstration. This fashion soon reached Okinawa. Initially, in jūdō practice the traditional keikogi (practice uniform) of jūjutsu was worn. Later the current practice uniform of jūdō with its longer sleeves and trousers was created and used during practice. As the training content in jūdō and karate was quite different, other functionalities of the practice uniform were necessary. The practice uniform of jūdō gradually adapted to its own necessities, as did the practice uniform of karate. In this way the current practice uniforms were born. In addition to the above noted contact with karate, when Kanō visited Okinawa, he invited Motobu Chōki (1870-1944) to a restaurant and eagerly inquired about karate. Kanō obviously had an extraordinary interest in karate. “The Textbook of Jūdō” (Jūdō Kyōhon, 1931). “The reason why I thought about this national physical education on the one hand is, my attempt to compensate for shortcomings in the previously established kata and randori of Jūdō, and on the other hand to consider the study of physical education on a national level in addition to the practice of the usual kata and randori”. The technical system of Judo. Grafic: A. Quast. After all it is quite possible that Kanō incorporated his studies on karate in the SZKTK of his Kōdōkan Jūdō. However, it is completely unknown who influenced who to what degree. Karate was far from being Kanō‘s only ressource on atemi. Actually, and other than often heard, atemi had been an integral part of many historical jūjutsu-like systems and went under many names, like kenpō and hakuda and others. 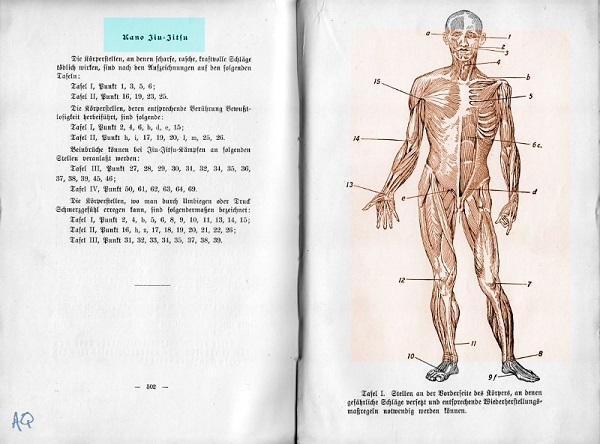 For example, in 1898 Prof. Dr. Miura read an article “On jūjutsu and yawara” in front of the “Deutsche Gesellschaft für Natur- und Völkerkunde Ostasiens”. Chapter III. was all about atemi strikes and kicks with all parts of the body. “Defense of a blow against the neck and a strike against the stomach.” Dschiu-Dschitsu, 1905. 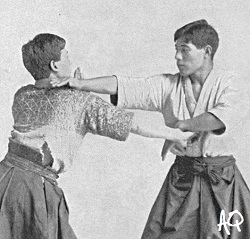 In the original version of “The Complete Kano Jiu-Jitsu” (1905) there was included a complete chapter on atemi. It should be noted that is unclear how much of Kanō’s “Jiu-Jitsu” is actually represented by this work, but atemi is also found in another work of the same year titled “Dschiu-Dschitsu” in the German edition. 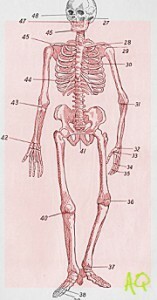 In addition, in Kanō‘s 1937 publication entitled “Judo (Jujutsu)” the kinds of techniques are clearly distinguished into the three categories of nage-, katame-, and ate(mi)-waza, including a list of the names and a diagram showing the vital points of the human body. Today atemi is fixed part of Kōdōkan Jūdō, yet only found apart from the all-swallowing Olympic competition form of jūdō. “Dangerous areas on the skeleton.” Das Kano Jiu-jitsu, 1905. 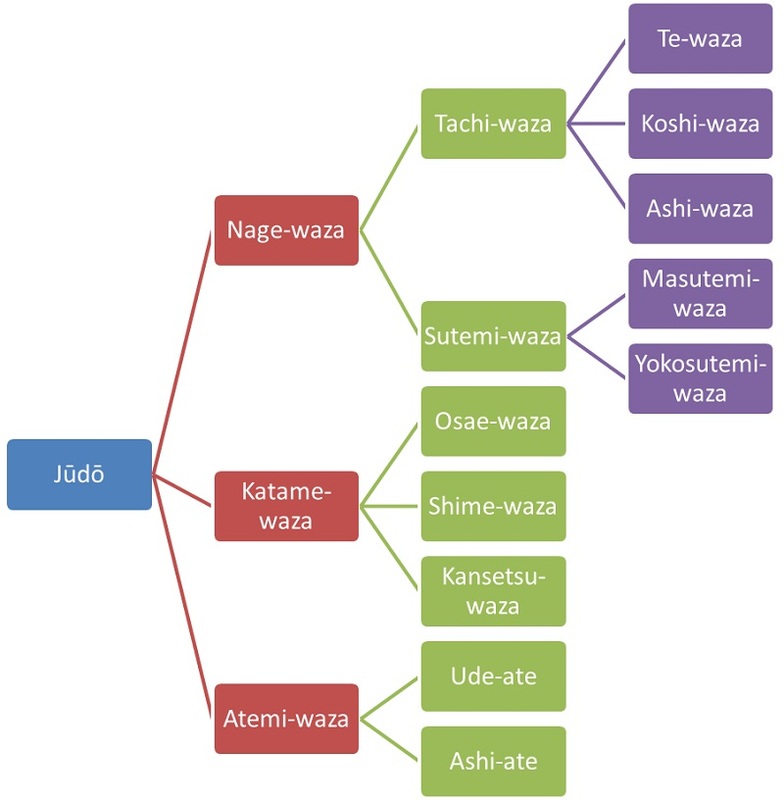 So while Gima Shinkin detected the techniques of “Okinawa Karate-jutsu” throughout the SZKTK, it might just have been the case that there was a similarity in both its combative classification – impact techniques – as well as its intention. Kanō aimed at a national physical exercise. The modus operandi of Okinawa Karate at the time – particularly in the school system, the representation of which is exactly what Kanō came to know – was nothing more than a combative-educative gymnastic for youngsters. It was about a combined combative health and fitness training. And this is exactly what Kanō aimed at with his SZKTK, or the “Form of national physical education of maximum efficiency”. See the following video and decide for yourself: Okinawa karate, Japanese atemi, combative health gymnastique, or all of it? This entry was posted in Unknown Ryukyu and tagged Funakoshi Gichin, Gima Shinkin, Hakuda, Judo, Kano Jigoro, Kano Jiu-jitsu, Kenpo, Kodokan Judo, Motobu Choki, Okinawa Karate, Seiryoku Zen'yo Kokumin Taiiku. Bookmark the permalink.